14 DVDs Concert Bundle. Each DVD is packaged individually. Note: DVD UPC codes are punched since this is a special wholesale purchase. Barre Phillips: Live in Vienna - As much a composer as a performer, Barre has worked in the area of film, ballet and theater throughout the years whilst his stage experience spans a wide range of musicial styles, from Coleman Hawkins to Cecil Taylor to Interactive Electronic music. His work in the '70s with John Surman and Stu Martin as "The Trio" became a model in itself, and influenced many younger musicians. This unique improvisation set demonstrates why Barre is in constant demand throughout Europe, North America and Japan as a soloist and improviser. Ben Sidran: Live At The Palais Des Festival Hall Cannes 1989 - Ben Sidran has been a major force in the modern day history of jazz and rock & roll having played keyboards with or produced such artists as Steve Miller, Mose Allison, Blue Mitchell, Diana Ross, Boz Scaggs, Phil Upchurch, Tony Williams, Jon Hendricks, Richie Cole and Van Morrison. Despite the reality that Sidran is better known in Europe and Japan than in America (a fact of life for most jazz musicians,) Ben Sidran is an international superstar. Band: Ben Sidran - Vocals & Piano, Gordy Knudtson - Drums, Bill Peterson - Bass, Bob Rockwell - Sax. Boby Hutcherson & Flora Purim: Cool Summer - Join an ecstatic audience at the renowned Harvest Jazz Festival at the Paul Masson Vineyards in California for a double bill concert sure to consume your soul. Fronting his own quartet, Bobby Hutcherson performs a set that is simply brilliant. Being consumed and overtaken by the crowd's electricity, Bobby delivers nearly a 30 minute improvisational performance. Influenced by both traditional and Brazilian singers and the improvisations of American Jazz Divas such as Ella Fitzgerald and Sarah Vaughn, Flora Purim demonstrates her music diversity with unique live performances including an improvisation with Airto Moriea on her major international hit "Nothing Will Be As It Was Tomorrow." Brian Torff & Manfredo Fest: Some Call It Jazz - Brian Torff is a renowned bassist and composer, and currently appears with his seven piece band. Thunderstick, featuring a horn section, with jazz violinist Randy Sabien, as well as the Union trio. Torffi's professional career began in 1974 when he began touring with Cleo Laine before he recorded and performed with pianists Mary Lou Williams and Marian George Shearing and their thrid album won a Grammy for vocalist Mel Torme. - One of the best-kept secrets among Brazil's bossa nova pioneers, Manfredo Fest's popularity and profile rose dramicatically in the 1990s. Legally blind since birth, Fest's greatest early influence was George Shearing, but he developed his own approach apart from Shearing and other Brazilian jazz pianists, unleashing relentlessy flowing streams of bop-flavored notes against a Brazilian pulse, occasionally letting his classical roots show, and enjoyed recording success upon signing with Cocord Picante in the early '90s and producing a serices of energetic, Brazilian-flavored, bop-grounded, small-group albums. Circus Bassissimus: Live In Vienna - A concert by the counter bass quartet CIRCUS BASSISSIMUS is a truly unique experience as their play list ranges from newly arranged compositions of the renaissance to rock 'n roll! Duncan McTier: Live in Vienna - Dun McTier has established a reputation as one of the world's foremost double bass soloists. His performances in major festival and concert halls throughout Europe and Japan have received the highest critical acclaim and inspired comments in the press such as: 'magician', 'champion of his instrument' and 'pure genius'. Egilsson, Perdersen, Darling: Live in Vienna - The double bass is the deepest of all string instruments. Not always upfront but an influential element in classical, world and jazz music. Kristin Korb: Live In Vienna - Combining the instrumental influence of Ray Brown and Charles Mingus and the vocal styling of Sarah Vaughan and Ella Fitzgerald, jazz bassist and vocalist Kristin Korb has created a sound all her own. This concert was filmed in early 2005 at Vienna's famous jazz club "Porgy & Bess," and features a truly magically performance by Korb. 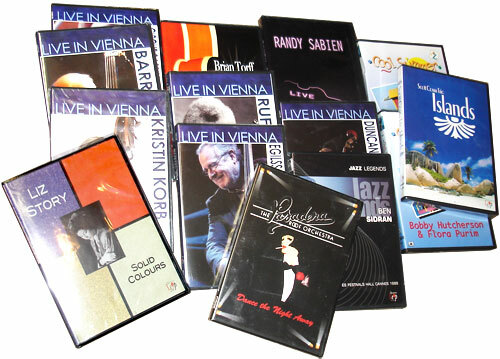 The DVD also includes insightful artist interviews interwoven with the live footage making it the complete package for Korb fans worldwide. Liz Story: Solid Colours - This 11-song performance from 1984 is undeniable evidence that Liz Story has established herself as one of the most distinctive composers and pianists of our time. The three-time Grammy nominee fashions a deeply personal style, balancing physical prowess against dedicated moods, colors and textures, which take shape at the elusive transitions between classical and folk with a rich jazz harmony of pioneers like Bill Evans, Story's acknowledged chief inspiration. Yet Colours is almost minimalist next to Evan's more densely textured works - a spacious blend of polychords, breezy runs, and finely timed sustenutos, with an accessible spirit and memorable melodies. The Pasadena Roof Orchestra: Dance the Night Away - With a classical repertoire drawn from the swinging 1920's and the lively 1930's, the Pasadena Roof Orchestra have provided unparalleled and energetic state shows to admirers around the world for over three decades. As US crtitic Scott Yanow wrote, "The PDO presents a fun concert with the emphasis on superior to dance tunes of the era... The authentic sound of the band, the superior repertoire and some insprired humor make it a delightful show." Randy Sabien: Live - Jazz violinists usually draw from one or two traditions. The best of both can be found in the superb Randy Sabien. He combines classical technique and folk energy in a program that's still strictly jazz. When Randy picks up his violin, get ready. His rhythmic, bluesy, swingin' sound will have you bobbing your head, tapping your toes and dancing right out of your chair as although Randy's musical aspiration began by studying classical violin, his direction did an about face the day he discovered he could play jazz on the violin! Rufus Reid: Live In Vienna - Rufus Reid's career began in Chicago and his extensive jazz background an discography reads literally like the Who's Who of jazz. He has traveled, performed and recorded with many of the great Jazz Masters whilst confessing to have been priviledged to share many musical moments wih icons such as Gene Ammons, Kenny Dorham, Eddit Harris, Sonny Stitt, Don Byas, Philly Joe Jones, Thad Jones, Mel Lewis, Dexter Gordon, Bill Evans, Stan Getz, Dizzy Gillespie, and Art Farmer. Scott Cossu: Trio Islands - Musician, composer and reocrding artist Scott Cossu's background in jazz and rhythm 'n blues, combined with his years of classical training and his study of ethnic music from Sudan, Tailand, China, Rumania dn Ecuador result in a unique music that has been performed in concerts worldwide and coreded since 1981. His music hows imagination and taste, with varied meters and tempo and the set with long-time sideman, electric guitarist Van Manakas and Eddie Wood on percussion, exhibits Scott's many departures from the new age field, with a melodic blend of jazz, classical and ethnic influences. Stan Getz & Alto Madness: Cool Summer - Stan Getz became known as "The Sound" because he had one of the most beautiful tenor saxophone tones ever heard. Throughout his career, which spanned six decades, Stan recorded as a leader for many labels including MGM, Victor, Columbia, and A&M (not to mention sessions with Lionel Hampton, Dizzy Gillespie and Garry Mulligan) and he has been featured on an album almost every year since 1946. - Richie Cole formed his own band "Alto Madness" following stints with the Buddy Rich's Big Band and Lionel Hamption, and having enjoyed the immense commerical success as Musical Director for Manhattan Transfer during their gold record years. His idea being essentially that any tune, no matter how unlikely its souce could be turned into exuberant bop. - On this DVD, these two amazing artists share with you their own unique style in ambient setting of the renowned Harvew Jazz Festival at the Paul Masson Vineyard in California. This festival has attracted the very best Jazz musicians and appreciative audiences from around the world.